It's not an exaggeration to say that the level of spoken and written English has declined in recent years. That's probably a claim that has been made every decade for the last two hundred years. But I truly believe that skewed syntax, bad grammar and malapropisms are more widespread now than in the past. Or maybe it's more accurate to say that those people are more likely to be heard or read (think of the proliferation of online media outlets and the need to staff them) and are more clueless (or shameless) about their language ignorance. Grammar mistakes in mainstream media are extremely common nowadays, especially online. The most common errors that have for years been an indication of uneducated people now clutter the pages of even the most well-known newspapers. These errors jump out at anyone with even a basic understanding of grammar and language usage. The editors of newspapers regularly seek refuge behind the excuse that the 24-hour news cycle means it's harder than ever to ensure error-free copy. I'll accept that even people who know the difference between "there," "their" and "they're" will sometimes type the incorrect word when bashing out an article. So that excuse may have some merit, but for the most part, there are just more people today who never learned how to write or speak correctly. Many of the mistakes that appear online are an indication that the people doing the writing (and the editing) do not possess the necessary skills to do their job. Why is this so? I would say that the education system is largely to blame. When I was going to school in Canada in the 1970s and 80s, grammar was not taught. The idea was that students would absorb the rules through activities and practice (inductive learning as opposed to deductive learning). Lo and behold, a few generations of semi-literates after moving away from more traditional teaching methods, and not only do many people not know how poorly they speak and write English, but there is no one to tell them when they make mistakes. Thankfully, because there are always some people around who possess critical thinking skills, and because some people in decision-making positions recognize the importance of language skills, deductive grammar learning is making a partial comeback. Beyond the claim of the frenetic pace of reporting and filing stories, there are other excuses for the legions of professionally employed language morons to hide behind. Any human weakness can become a virtue. When enough people possess that weakness, there is no further need to defend. What used to be an excuse becomes accepted wisdom. When the borderline incompetence of many reporters and others who are paid to write is highlighted, the person doing the highlighting is likely to be dismissed or ridiculed. The tut-tutting and supposed arrogance of anyone who points out the mistakes are more worthy of discussion than the mistakes themselves. The tools of the trade are words and grammar, but somehow, expert usage is not considered a requirement. Of course, moralizers of any kind are necessarily self-righteous. The two are inexorably intertwined. You cannot be one without the other, and I'm guilty as charged. The funny part about this focus on the people complaining about bad grammar is that many of the so-called grammar Nazis are being played for all they're worth. All newspapers now encourage anyone who sees mistakes in their online rags to dutifully report them. How thrilling! I am a more skilled editor that the ones employed by big newspapers! And look! I reported a mistake, it was promptly corrected, and I even got a personal email thanking me! You bloody fools! Why on earth would you provide your services for free when you could otherwise let the mistake stand, thus highlighting the sloppiness and perhaps increasing the likelihood that the buffoons in charge might take steps to improve the quality of their product? But I want the focus of this post to be about speaking, not writing. There is one extremely common mistake that many people currently make when speaking. It's not a careless error made while the speaker is passionately arguing a point. It's not a one-off blunder made when tired or annoyed. It's a fundamental gap in the speaking ability of the people in question. This obvious blunder is committed not just by people from lower socio-economic classes. 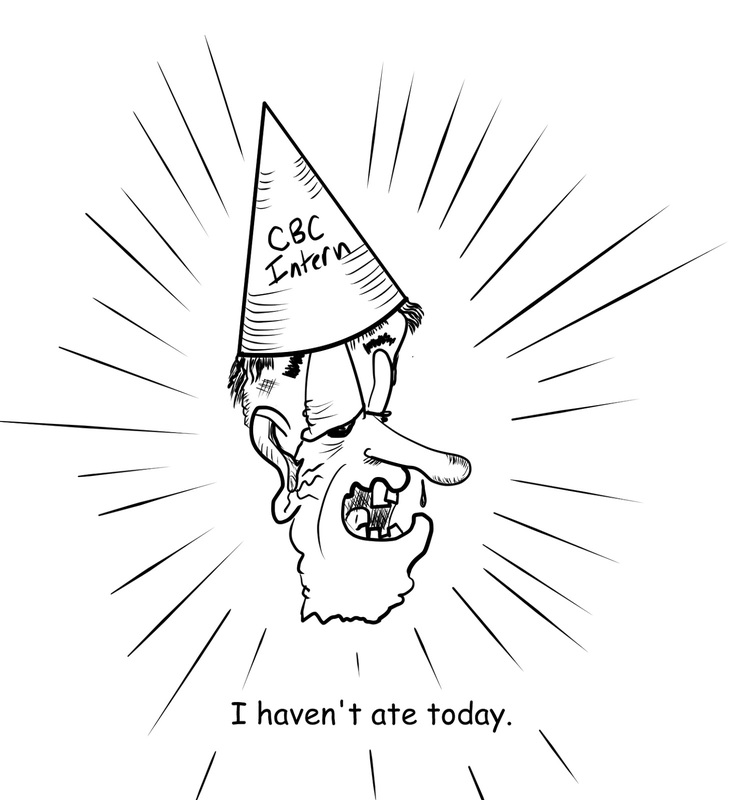 I have heard doctors, lawyers and newsreaders speak in this fashion. It makes me cringe every time I hear it. My mother claims that a friend of hers who is a principal in a school in Canada makes this mistake whenever she speaks. And what is this most shockingly bizarre lapse in fundamental language skills? One that what would have, years ago, been a mistake worthy of a solid cuff to the side of the head? I haven't went to the movies in a long time. Have you ever ate spicy food? It is hard to fathom that people who speak like this are not aware of it. And it is also hard to believe that no one has ever pointed out to them how ignorant they sound. My guess is that they know full well that this major gap exists in their ability to speak the English language. But they just don't care. It likely warms their hearts when they are in the company of other semi-literate mules who were also never taught how to speak correctly. And that is the modern-day mark of ignorance among native English speakers. This is a simple classroom activity for students to practice using "and" and "but." You can easily modify it to suit any topic, and you can use it to focus on writing or speaking. Again, notice that the questions are in pairs so that in the second half of the activity, the answers to the questions lend themselves to using "and" and "but." 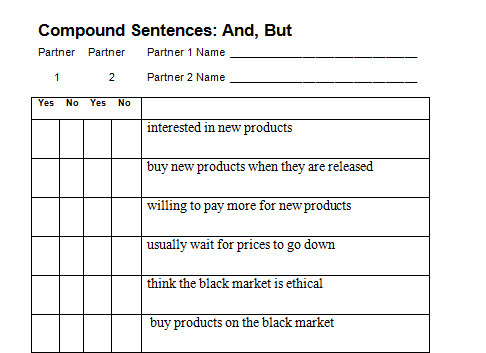 I created this particular worksheet for a business English class about shopping and new products. 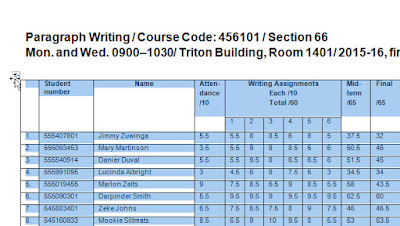 Once you have prepared your worksheets and have met your class on the appointed day, divide them into groups (for this activity, I've found that groups of four work very well). If you have a prepared spiel about the topic in question and any relevant vocabulary, give it to them now. Then, tell the students that there are two parts to the activity. Hand out the worksheet and tell students to ask and answer yes/no questions in the necessary verb tenses with one or more group members. Let the students know that you will fill them in on the second half of the activity after they have finished interviewing each other. Telling students about both parts of the activity at this point would overload them with too much information. After the students have finished interviewing each other, tell them that they are now going to take turns telling the rest of their group about the responses of one or both of the individuals they have interviewed. In other words, each group member takes a turn to speak to their entire group about the answers of other group members. Before they proceed, point out to them that all the questions are in pairs. This part of the activity also requires students to conjugate verbs for third person singular. The examples I used here are quite varied, though for lower level students, you could ensure that the structure for all questions is the same. 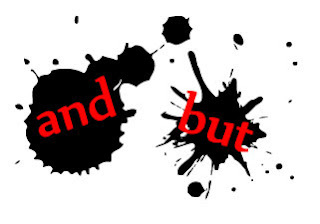 Also, instead of only practicing compound sentences with "and" and "but," you could also practice complex sentences with subordinating conjunctions such as "however," and "despite." And that's all there is to it. A simple activity that is adaptable, easy to prepare, easy to explain, and which allows students to practice a number of different skills and to focus on using "and" and "but." 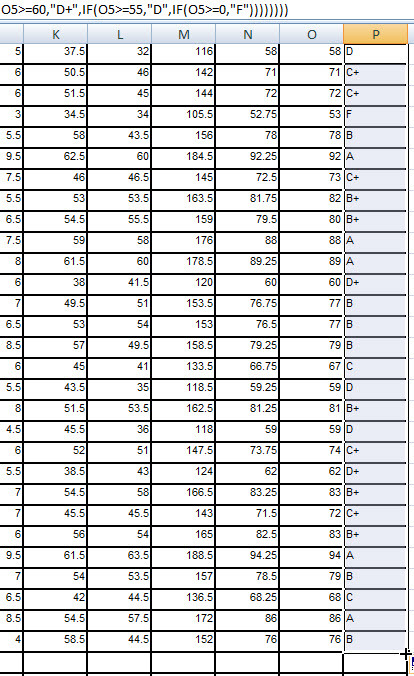 Many schools now use grading software to make life as easy as possible for teachers. 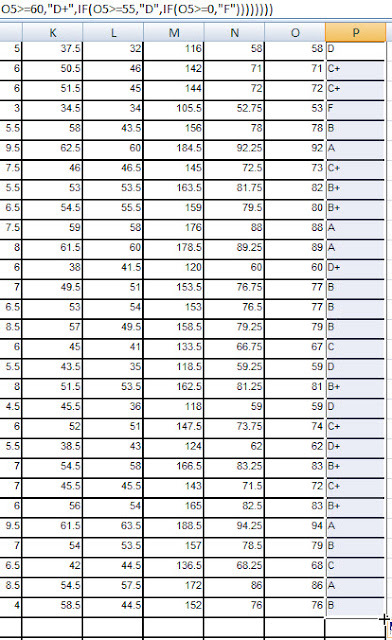 However, other schools have online grading systems, but the teachers are still responsible for tallying points and calculating grades based on an approved grade range. Many luddites exist in the world of teaching who believe there is some virtue in spending hours with a calculator and pencil adding up rows of figures. Despite how proud they remain about doing it the good old fashioned way, their calculations remain susceptible to errors. Why spend all those hours tallying points and calculating grades when you can do it in minutes with Microsoft Excel? 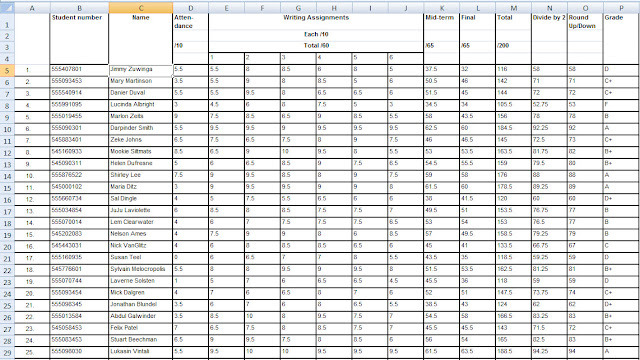 This tutorial aims to make tallying points and calculating grades as simple as possible for teachers. 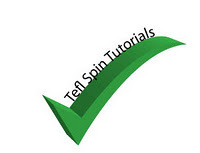 I have created this tutorial with no assumptions about the skill level of the people using it. 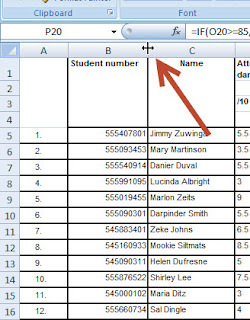 In other words, if you follow this tutorial step by step, I guarantee that you will be able to use Excel to tally points and calculate grades for your students and as a result, you will save hours of time. 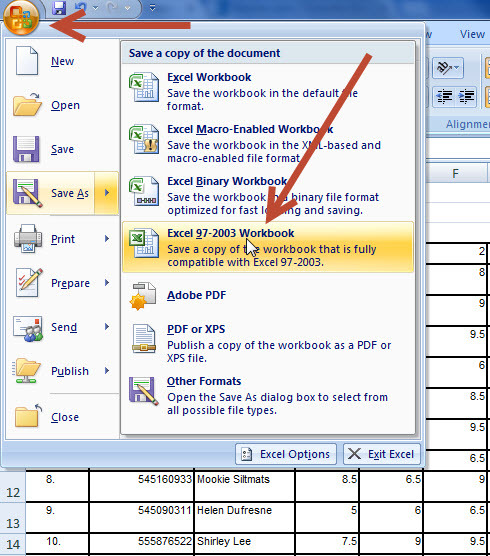 This tutorial is intended for Microsoft Windows 7 operating system and Microsoft Excel 2007. 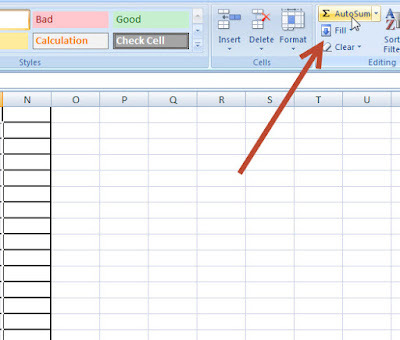 However, the instructions well may work with other Windows operating systems and other versions of Excel. 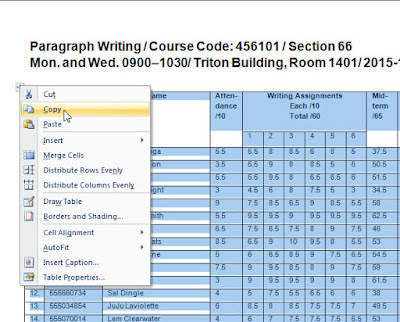 Note: If you do not wish to use Microsoft Word, and instead want to keep all the points for your course in Excel, you can skip to subsequent parts of this tutorial. I maintain a Microsoft Word document throughout the semester for aesthetic reasons—I think a printed version looks better. 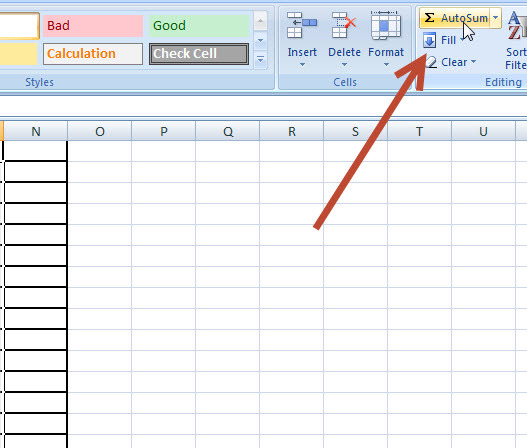 Plus, as you will see, it's so simple to import a Word document into Excel, that it is really not much added work. 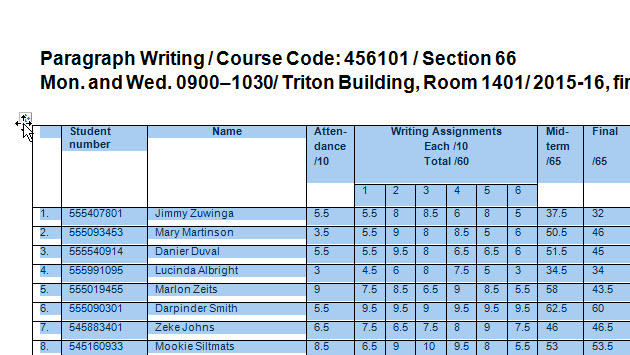 Note: In the Microsoft Word document I imported into Excel, I already had an empty column labeled Grades. 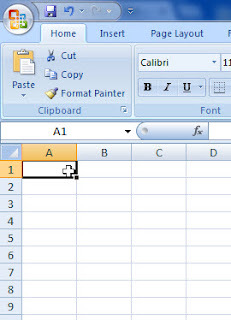 If your document did not have an available empty column, place your cursor in the right-most column, right click, click Insert and enable Entire column. 4. 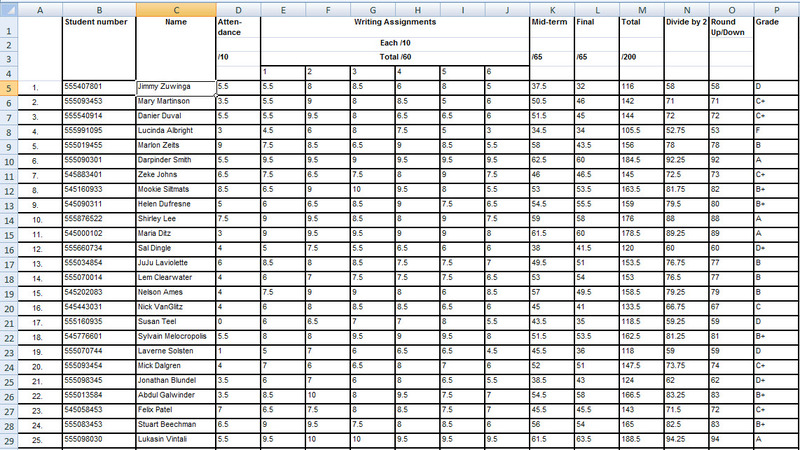 Click in the last column of the Excel table, right click, click Insert and then enable Entire column. 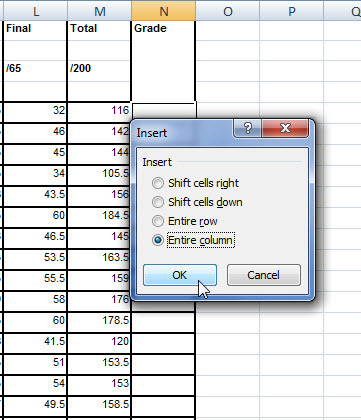 Label the new column "Divide by 2"
Note 1: Take careful note of your particular Excel document. 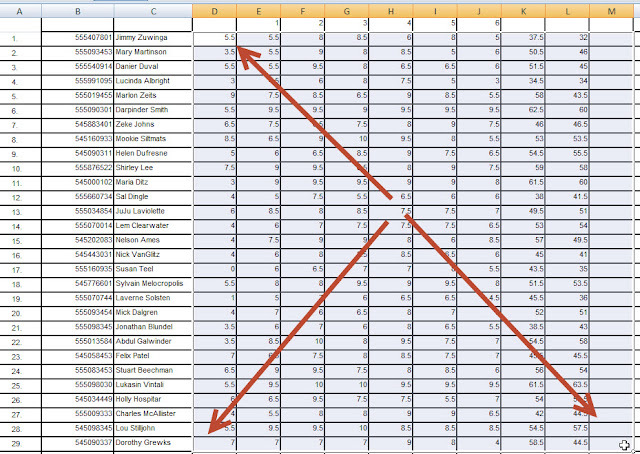 The "M" in the formula I used above indicates the column letter of the column which contains the figures I previously tallied, not the column where I want the next column of calculations to appear. 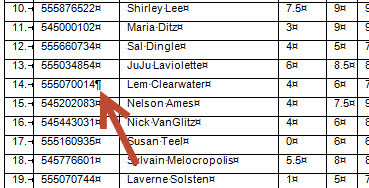 The column of tallied figures likely appears in a different column letter in your document. 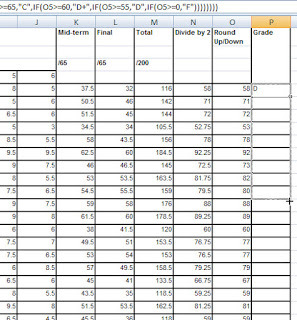 Note 2: This step is done to divide the points total for each student in half because, for this particular course, the points total is out of 200. Obviously, omit this step if necessary or alter accordingly. 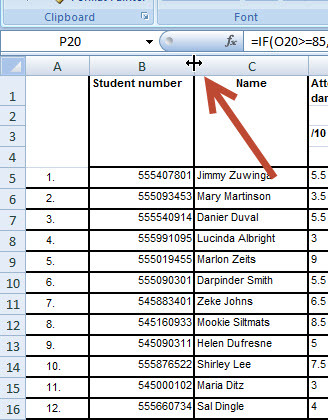 Caution: Be careful not to confuse the row number of the Excel document with the number next the first student's name in the list. 6. 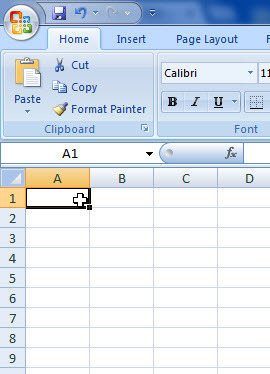 In the first relevant cell of the new column, hover your cursor in the lower right corner until a black cross appears. Result: The new row of figures, divided by two, should appear in the new column. 1. 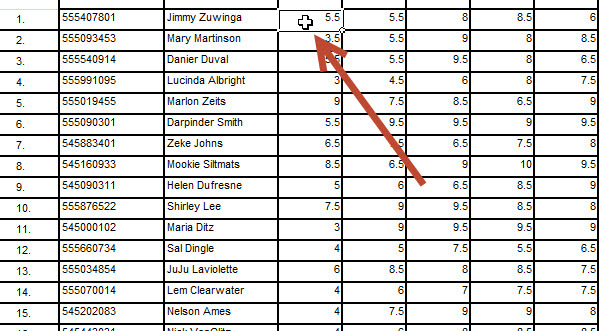 Click in the last column and create another new column (see step 4 in the previous set of instructions), and label the new column "Round Up/Down"
Result: The new set of figures have no decimal numbers. 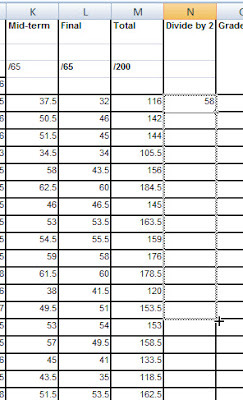 All figures which previously had a .49 or lower decimal have been rounded down and all figures which previously had a .5 or higher decimal have been rounded up. Note 1: As with previous formulas discussed above, note the relevant column letter in your own document. 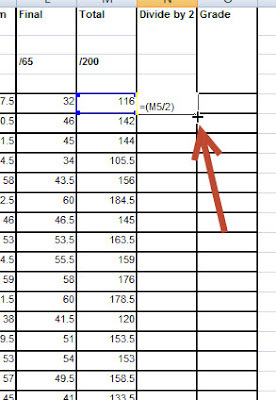 You are using the column letter that corresponds to the column with the most recent calculations (in our case, the Round Up/Down column). 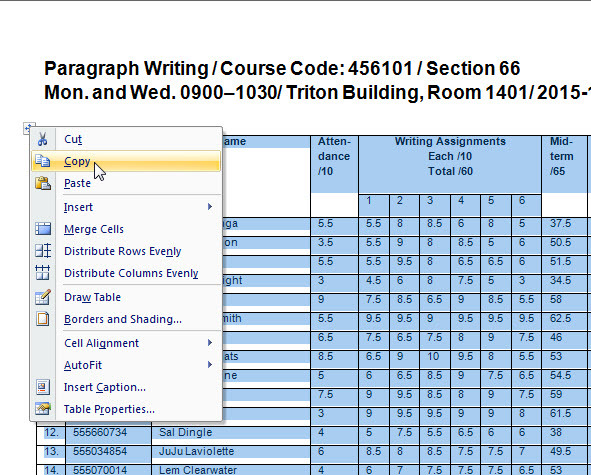 Also, of course, enter the relevant details for the grade range you are applying. Note 2: For future use, I recommend you copy and paste the formula into a Notepad file and keep it in a folder with any other documents you may have related to calculating and entering grades. Note 3: This formula, of course, needs to be entered precisely. 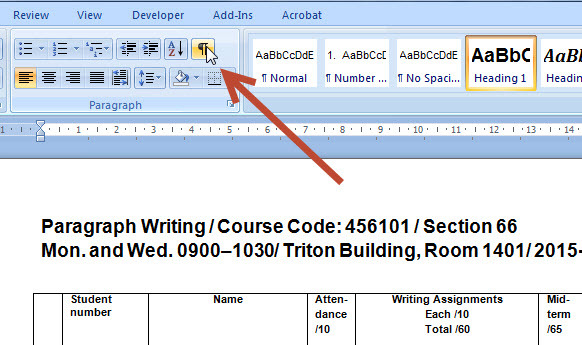 Notice in the screenshot the colour-coding of the closing brackets, which correspond in colour to the opening brackets. There should be one closing bracket for each "IF" statement. 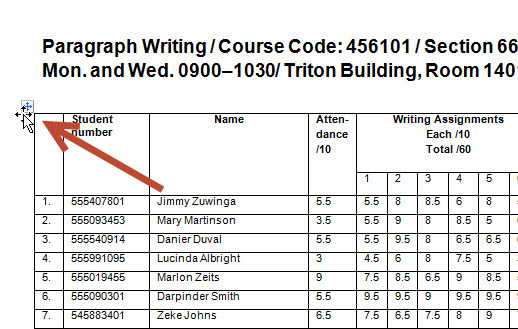 Result: The final grades should appear in the relevant column. There you have it. 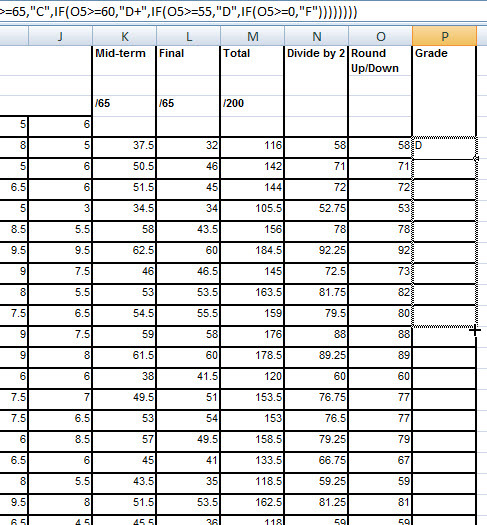 An easy way to tally points and calculate grades. The great thing about the final Excel document is that if you change any of the point totals for any of the categories, all the calculations will automatically update accordingly. For example, when the worst case scenario happens and a student fails a course, I go back through all assignments and exams in the hopes that I may have missed a point here or there. 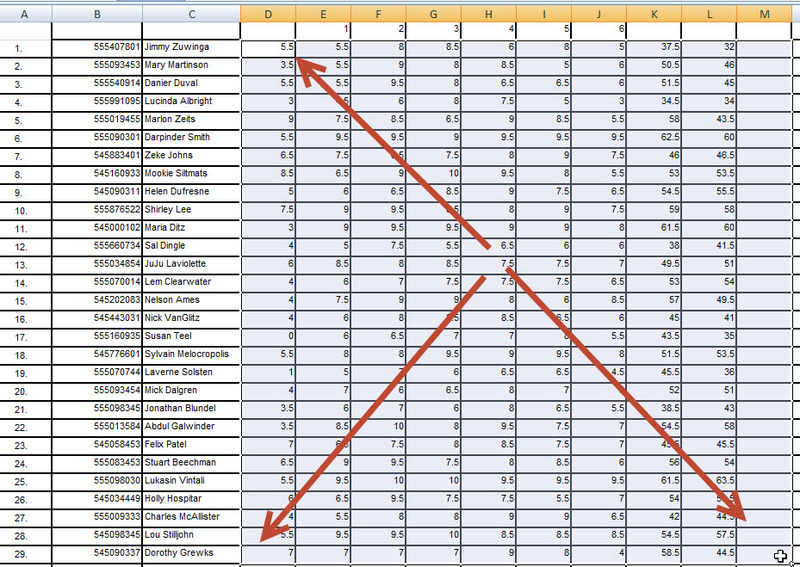 If I find a few missing points, I simply update the relevant cell in Excel and see if the final grade has changed as a result. 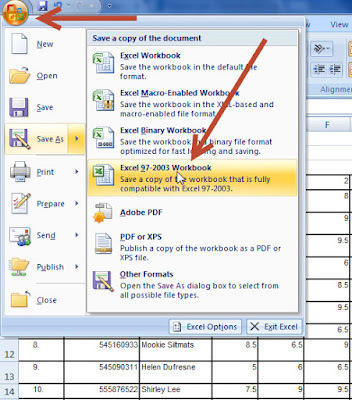 One final qualifier: as with all software programs, in Microsoft Excel, there are numerous ways to perform the same function. I have found the above methods the most effective and straightforward. If you have any shortcuts to recommend, or any other methods you feel are more useful, please include them in a comment.